While you’re out walking with your kids and enjoying this beautiful spring weather, bring along this free printable Spring Bingo game for your kids to play. It’s a fun & easy game that everyone can participate in! Simply print the game and have your children point out the items to you as they find them. You can use this game over and over again since every walk is different and there will be new things to discover. What is your favorite thing about spring? Let us know in the comments below! 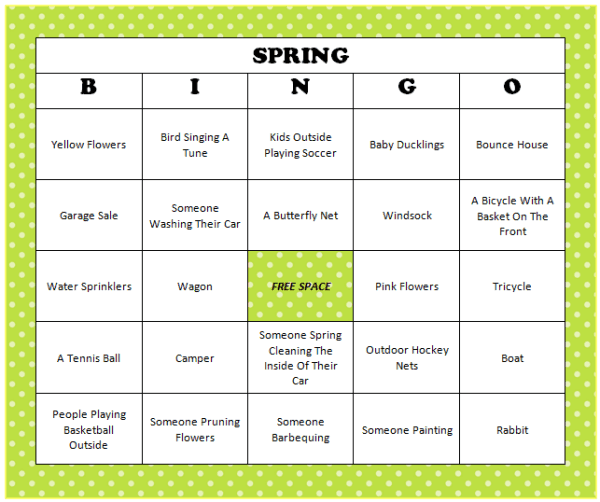 Did your favorite activity make it onto the Spring Bingo game? I’d have to say my favorite thing about spring is the warm weather since I spend most of my winter hibernating indoors. Looking for more fun & free games to enjoy with your family? Check out our Free Printable Games page where we have loads of freebies like scavenger hunts, charades, word searches, word scrambles, trivia and more. We love requests from readers and are open to your suggestions. Have a party you need activity ideas for? Let us know! Need family-friendly ideas for a specific holiday? Check out our Holiday Fun page. If you can’t find what you are looking for there, let us know and we’d be glad to help. I say “we” because we have a wonderful community of readers that is always willing to share ideas as well. To stay updated on the latest ideas for family fun, follow along on Facebook, Twitter, Pinterest or our new RSS feed Bloglovin’.